How could friends coming together for a night of celebration know that the night could end in murder? 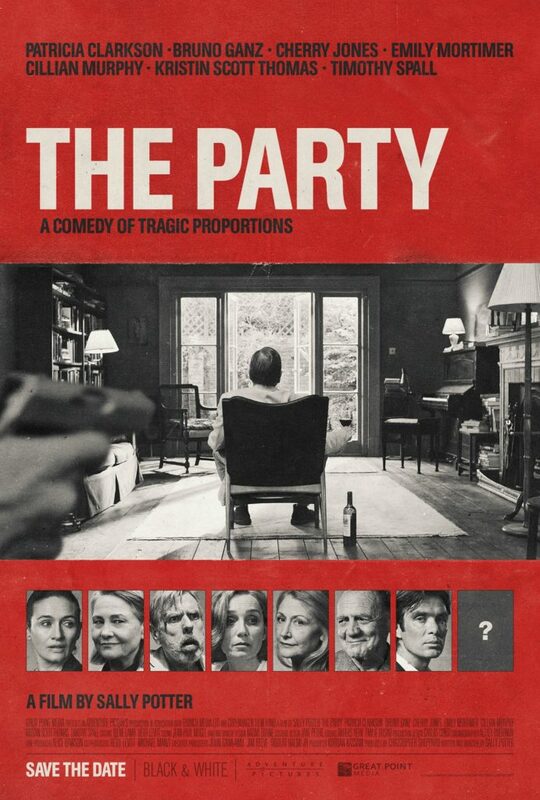 One of the most talked about competition titles of the 2017 Berlinale, THE PARTY by master director Sally Potter will leave you laughing at one point, shocked at others with it’s star studded cast and unique style. You will not believe what will happen at that party! The only thing Janet wanted was to have a party to celebrate her political success with friends. Because her phone is ringing off the hook with people calling to celebrate, she doesn’t really notice her husband who is sitting in the living room all alone, maybe a little bit sad. But anyway, she’s quite preoccupied with the “I miss you” texts that she is recieving on her phone. Her best friend April arrives with her annoying boyfriend with whom she has broken up with. Martha and Jinny, join the party with some good news of their own. Tom arrives last, but his wife will arrive later, he says. During the night filled with music and conversations, one by one their secrets are revealed. The biggest secret of the party where it’s nearly impossible to understand who cheated on who with who, is who will die at the end.